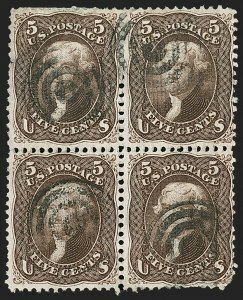 FRESH AND FINE ORIGINAL-GUM BLOCK OF FOUR OF THE 1868 5-CENT F GRILL. VERY FINE APPEARANCE. 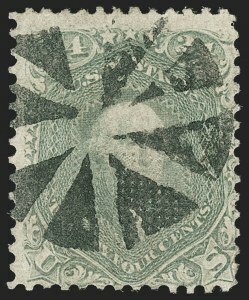 A RARE USED BLOCK OF THE 5-CENT F GRILL. THIS IS THE ONLY EXAMPLE WE HAVE OFFERED SINCE KEEPING COMPUTERIZED RECORDS. 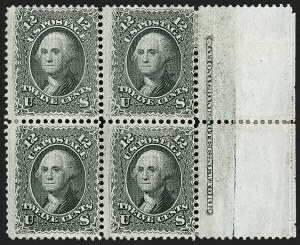 There is no recorded used multiple larger than a block of four. 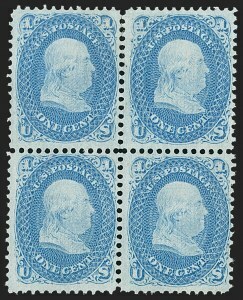 Used blocks are extremely rare -- we have never offered any others in our Rarities sales or other auctions since 1994. 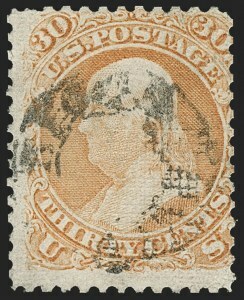 FINE-VERY FINE AND EXTREMELY RARE ORIGINAL-GUM BLOCK OF THE 1868 10-CENT F GRILL. Almost every 10c F Grill block with Very Fine or better centering has been broken to satisfy demand for singles. FINE APPEARANCE. 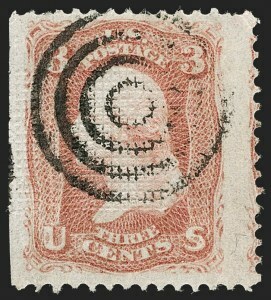 A RARE ORIGINAL-GUM BLOCK OF FOUR OF THE 1868 12-CENT F GRILL, WITH END ROLLER GRILL AND IMPRINT SELVAGE. 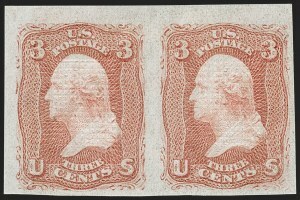 A BLOCK OF FOUR IS THE LARGEST RECORDED MULTIPLE. Our records contain around a dozen original-gum blocks of the 12c F Grill. 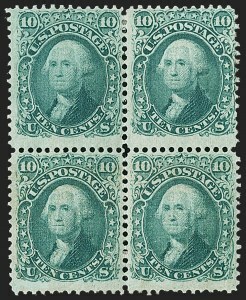 Some of these have may have been broken to feed collector demand for singles, and therefore the number of surviving multiples may be smaller. 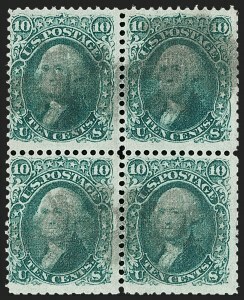 Blocks of four are the largest surviving multiples, since the Caspary block of eight has been broken. 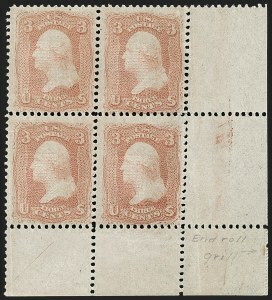 FINE-VERY FINE APPEARING UNUSED BLOCK OF FOUR OF THE 1868 15-CENT F GRILL. 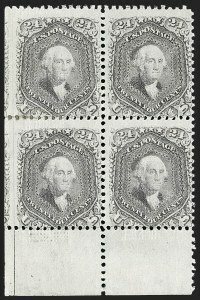 The largest recorded original-gum multiples are a reconstructed block of 20 and a block of 16. 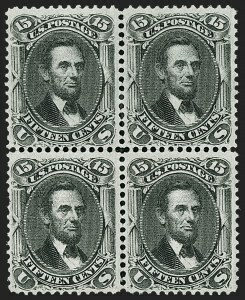 Both are significantly off center with perfs cutting far into the stamp designs. FINE-VERY FINE. 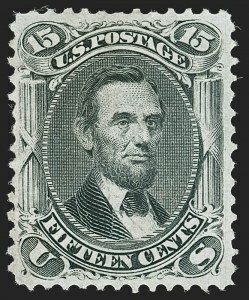 THIS IS PROBABLY THE LARGEST RECORDED USED MULTIPLE OF THE 1868 15-CENT F GRILL. 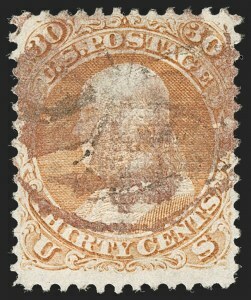 As an indication of rarity, the Twigg-Smith collection lacked a used block of Scott 98. 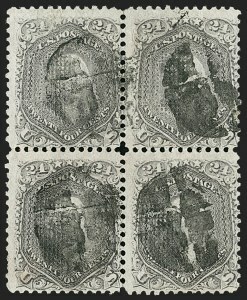 The Ishikawa collection, known for its multiples, contained a used block of four. 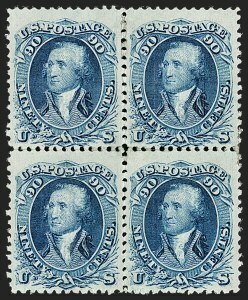 We have offered only one used block of four since keeping computerized records. 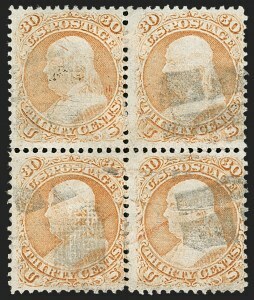 Scott Retail as block of four and pair. FRESH AND FINE. 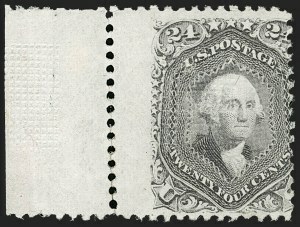 A REMARKABLE POSITION BLOCK OF THE 1868 24-CENT F GRILL, SHOWING SPLIT GRILLS. 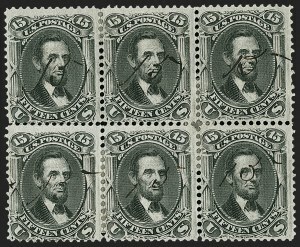 Our extensive records contain perhaps a half-dozen or so blocks of four, plus a block of fifteen and an imprint and plate no. 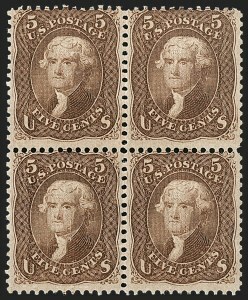 block of six. 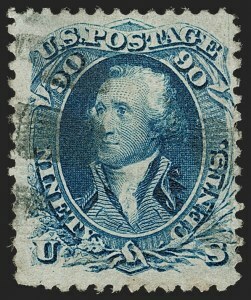 This is the only block with the split grill variety. FINE. 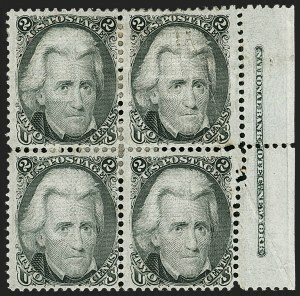 AN ATTRACTIVE AND RARE SOUND USED BLOCK OF FOUR OF THE 1868 24-CENT F GRILL. 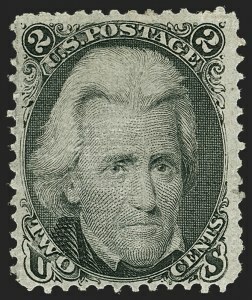 Approximately a half dozen used blocks are known. Most have faults. FINE APPEARANCE. 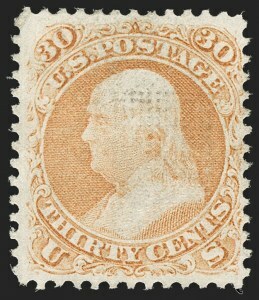 THE 30-CENT F GRILL IS ONE OF THE RAREST USED BLOCKS. ONLY FOUR OR FIVE ARE KNOWN. All of the other used blocks in our records have faults and are off-center. FINE-VERY FINE. 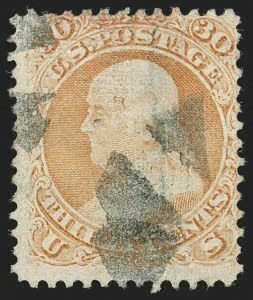 ONE OF THE RAREST AND MOST OUTSTANDING CLASSIC BLOCKS -- NO MORE THAN THREE UNUSED 1868 90-CENT F GRILL BLOCKS ARE BELIEVED TO EXIST. 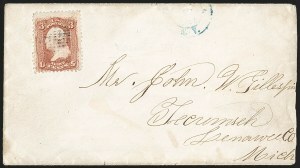 THIS IS THE FIRST WE HAVE OFFERED SINCE OUR 1998 ZOELLNER SALE. Brookman estimated that only three unused blocks may exist. 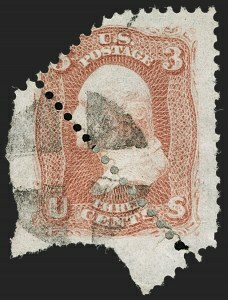 We have been able to locate only two, both with similar centering. 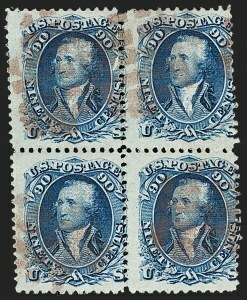 One is ex Caspary, Lilly and Ishikawa, and has some disturbed gum on the right stamps and a crease on the bottom pair. The other is the block offered here, which is ex Sinkler, Bechtel and Zoellner. 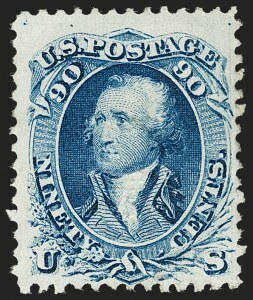 This block is also possibly ex Worthington or Hind; both collections contained a 90c F Grill block, but the sale catalogues were restricted from having photographs of stamps, which accounts for the confusion as to the number known. 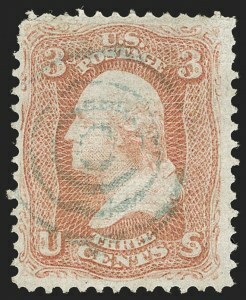 Ex Sinkler, Bechtel and Zoellner (where acquired by Mr. Drews for approximately half its then-current 1998 Scott Catalogue value). With 1998 P.F. certificate.